I’d already wimped out of a wet solo ride earlier in the week. So couldn’t really back out this time, as I was leading a group ride now, and despite receiving a fair number of early morning DNS texts, there were still a few who wanted to get out and explore Essex. So, wrapped up in my waterproofs, I pumped up my tyres, checked for grit bits, and rolled out the front gate. Even in the warmed up city centre it was freezing cold and wet. The traffic from London Bridge all along Bishopsgate was already, early on this Saturday morning, backed up completely, due to some building work or something somewhere in the city as all roads in that direction were closed. 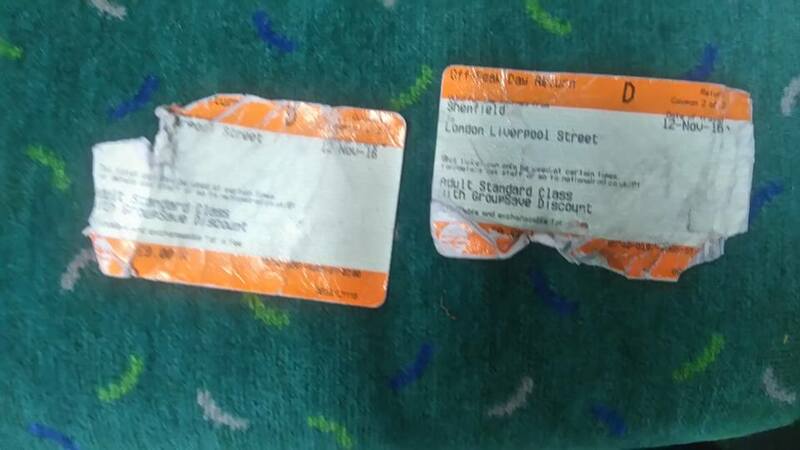 I was determined to recover my London zen that I had lost in quite dramatic fashion the previous day. People who know me on Facebook will understand what I’m talking about, possibly having read my rather uncharacteristic rant (since deleted out of embarrassment!) but I’m not going into it here. Suffice to say, I had resolved to not get angry about stuff, and was hoping a day out on the bike would clear my head. Seven others joined me at the station. 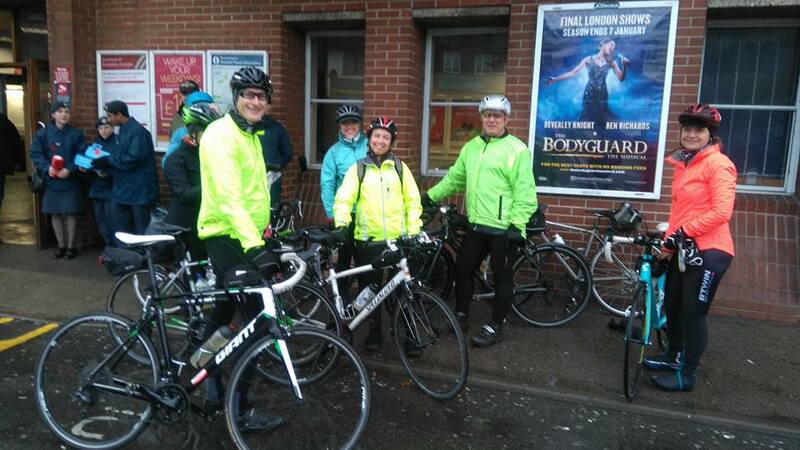 Six women, but only two men (not quite as hardy, our male members) eased their bikes off the train at Shenfield and on to the shiny wet Essex roads. I soon began to feel much better. It was wet, yes, cold, certainly, but there was hardly any wind and the cool autumn air felt calming yet envigorating all at once. On the approach to Buttsbury Ford, expecting a torrent, I headed straight for the little path bypass. However, despite all the rain, the ford was dry! Everyone else stuck to the road, as I skidded back down the muddy path to rejoin them. I was by now betting on when our first p thingies would arrive, The conditions were perfect for multiple fairy visitations. Very wet roads, loads of debris washed out on them. So I was prepared, pessimist that I am, for a day of wrenching cold tyres off resisting rims, vain searches for miniscule bits of grit, and aching arms from relentless pump pushing. Well, we got one between the lot of us. It was a repeater, but the repeat was dealt with at the lunch break. Pays to be a pessimist. Because, while everyone else is moaning about frozen fingers struggIing to force unyielding tyre beads into place, you’re ecstatically happy you’ve only had to do this once or twice! No they didn’t find it! We had to do it all over again a mile down the road. 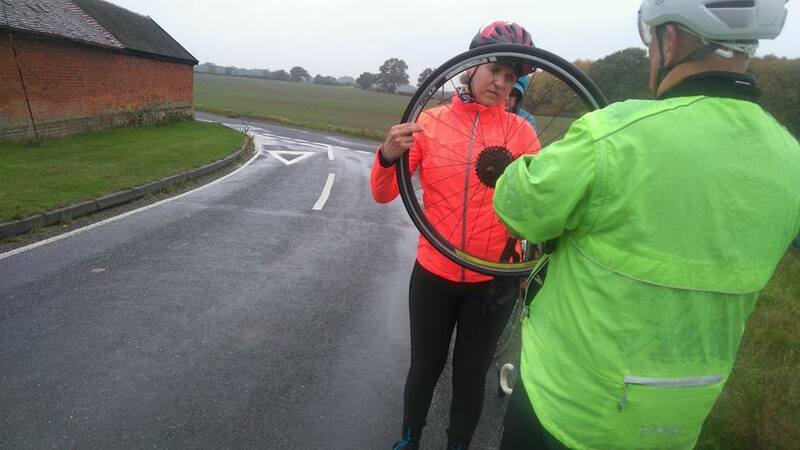 That happened about 7 miles in, just beyond Mountnessing on the empty Padhams Green Rd, under wide, grey rain filled skies. Then we were on our way again, just before the warm glow of riding began to fade and the cold began to creep back in. We soon warmed up on the little rise into Ingatestone. This is largely a flat ride so no real Kent style hills to get the blood pumping. But enough long stretches of well kept country roads to stretch out on. On through Mill Green, into a stretch of lane that runs through a lovely little patch of woodland, where we seemed to be riding through a fairytale illustration of autumn. All the usual sounds were stilled in the mist rising up from the golden ferns, the trees, still half covered in leaves of varied autumn colours, the other half drifting down or already covering the woodland soil. It’s a lovely stretch of road. Past the Viper pub and on through more tiny Essex villages and hamlets, the lanes growing quieter all the time. Folk remarked how empty of cars this area was and how amazingly well maintained the back lanes were. We are so used to the potholed tracks of Kent and Surrey, we felt completely spoiled. Very few holes and defects in these lanes. Every little village we passed seemed to have a very distinctive little church, that are essential Essex in style. Little wooden towers, simple little buildings. Sadly, it wasn’t possible to take many photos in the rain, so impossible to share just how beautiful much of this ride is, even on a wet autumn day, in fact especially on a wet autumn day, when the woodland colours are so alive, against the mist and cloud. Touch screen operated phone cameras are impossible in the rain! They think every drop is an instruction and go crazy (well mine does anyway). We began to turn westwards and heading into DunRun territory. Fyfield went by, unrecognisable in daylight, if I’m honest. 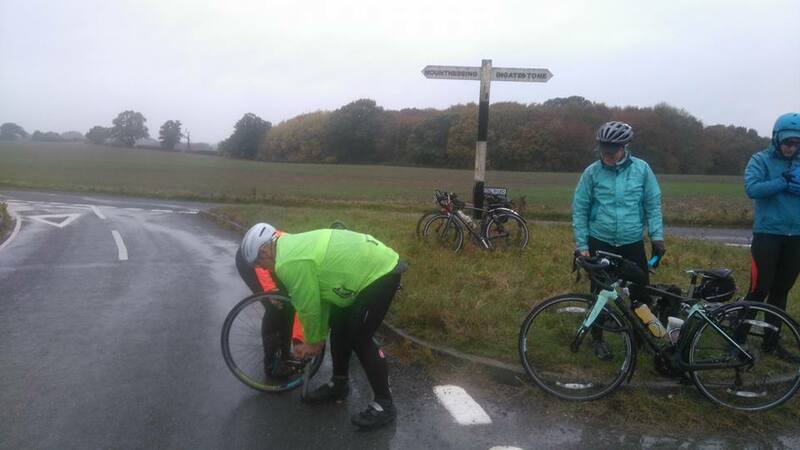 Fiona had done a great job checking out lunch stops, a job I’m particularly bad at, more accustomed as I am to snatching a few bites of flapjack by the roadside. Through Matching Green, on to Matching Tye and the Fox. I have to be honest and say the French Onion soup I had in the pub was infinitely preferable to a bite of flapjack in a bus shelter. Thanks Fiona! Back on the road and now less than 20 miles to go, despite the fact that it was still raining, we warmed up again pretty quickly. As we grew closer to our starting station, Shenfield, the roads grew gradually busier. I turned down one very quiet, wooded narrow lane, expecting it to be rough and full of potholes, but probably worth it to avoid a busy main road. It was unbelievably smooth and well maintained, better than a main road in London. Dagwood Lane near Doddinghurst. So good I wanted to ride it twice! As we approached Brentwood, the road began to climb, slight but definite for quite a few miles, making it tough for those in the group who hadn’t done much riding this summer. The last couple of miles weren’t the most pleasant, heading back through Brentwood’s busy roads in the dark, roads where the drivers don’t seem to have much experience of cyclists, or maybe just don’t care. In the future, I’d use my normal way back to the station, even though it would involve doubling back on a bit of outward route. I pulled my tickets out of my pocket so the gate attendant would let me through. He was mildly amused and let me through despite the fact he had no way of checking their validity, such was their tatty, sodden state! Back at Liverpool Street, we parted, most to get the Overground back south of the river. It was still damp. I couldn’t seem to persuade anyone to ride back with me! Shame. In all, with my ride to and from the station, the ride is about 65 miles, I guess. Although, my creative mapping disagreed with Fiona’s more consistent and careful approach most of the day!